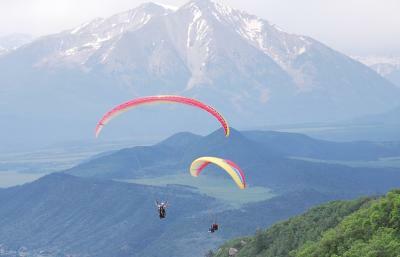 Soar over the Rocky Mountains of Colorado by going on a Aspen / Snowmass paragliding ride in the area. You will experiene the thermals like a bird and the best Aspen / Snowmass, Colorado area memorable mountain experience. You don't need experience one of the certified guides will fly you tandem with your safety first and foremost in their mind. Colorado paragliding truely a unique adventure. Aspen Paragliding is the premier paragliding school in the country.